Bents grain elevator, January 10 2012. Photo by author. A new and fashionable trend in tourism is invading rural regions of western Canada. SUV crossovers, front windows obscured by maps and cameras, are driving down gravel backroads, sweeping around correction line curves and screeching to a stop when a wide-eyed fox creeps across to its den in the culvert. Are lazy Sunday drives, once the mainstay of 1950s nuclear families, making a comeback? Are the drivers frantically trying to find the way to an uncle’s farm they haven’t seen since childhood? No. The latest tourism destination is the proverbial ‘empty’ Saskatchewan landscape itself. Or, more specifically, the landscape of places that used to exist, but are no longer there. Welcome to the latest tourism craze: hunting for ghost towns. Now, as a rural Saskatchewan resident, I have been in my fair share of abandoned buildings. Driving through our local area with my favourite tour guide (my father in law) is always a lesson in family and community history, as well as sundry tawdry or titillating stories. Lost diamonds, the great Saskatchewan Ruby Rush, and concealed murder weapons dot his childhood memories, each one tied firmly to place. Within our rural municipality, we have not one, not two, but three ghost towns: the now-extinct villages of Marriott, Valley Center, and Bents. All three were on the same railway line and boasted elevators, stores, post offices, community halls, and schools. Each gave their rural residents a unique postal, and therefore individual, identity. “Where are you from?” “I am from Valley Center.” These villages are known primarily to their ‘inner circle’ of nearby residents who a) know where the town is (or used to be), and b) got their mail at that post office or went to that school when they were kids. 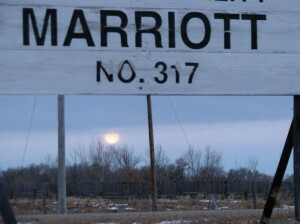 Picture of Marriot, SK, January 10 2012. Photo by author. All a ghost town hunter needs is a vehicle, a camera, and a road map (preferably one with gravel roads as well as highways). The official definition of a ‘ghost town’ is a place that was once incorporated, but has since lost (or forfeited) its designation. But after that, it’s a crapshoot. There might be nothing, not even a sign to mark its existence, and a ghost town hunter wonders: am I in the right place? At another site, there might still be buildings or even a few people there, and probably a community hall. Mapmakers, after all, don’t have to drive out and check if a town still exists. Maybe all those ‘empty’ Saskatchewan spaces look better when there is a name marking human civilization – even if it was in the past. 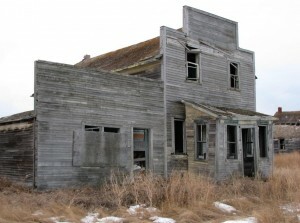 Why are there so many ghost towns in Saskatchewan? At the height of its (first) boom in the early 20th century, Saskatchewan was the third largest Canadian province by population, right behind Ontario and Quebec. Raw energy, outside investment in a booming real estate market, and the sheer sweat equity of hundreds of thousands of people immigrating to the ‘Last Best West’ to homestead or set up businesses created an unprecedented explosion of people and money. Villages popped up like mushrooms, every five miles along the branching tentacles of the rail lines. 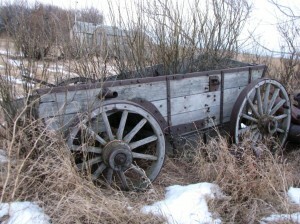 Photo of Valley Center wagon, January 10 2012. Photo by author. Over the course of the twentieth century, shifts in farm economics, mechanics, machinery, and government support for ‘efficient’ farms led to ever-increasing farm sizes and an ever-decreasing rural population. An improved road system to serve a mobile automotive population led to even more rural depopulation. Grain trucks took the place of wagons, hauling larger loads longer distances. By the 1960s, short line railways, once the mainstay of small towns, were ripped out. Inexorably, the pull of larger centers and Alberta’s oil boom combined with farm consolidation. Rural depopulation was a long, slow bleed of the countryside, a vampiric draining of energy, money, and life. Ramshackle buildings on isolated farms and ghost towns, mere skeletons of their former glory, are all that remain. Bents, SK. January 10 2012. Photo by author. Yet, those skeletons, which were once testimony merely to a dying Saskatchewan, have been rejuvenated. 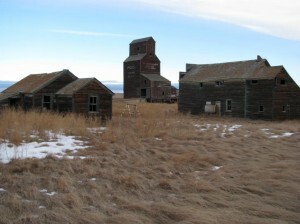 There are at least six websites that reference Saskatchewan ghost towns, including Wikipedia, that fountain of knowledge, which has a list of 116 ghost towns across Saskatchewan – incomplete, but a good try nonetheless. Photography websites such as Panoramio and Flickr help amateur photographers show off creative ghost town shots. One website in particular, http://biseenscene.com, has gone even further and created a ‘how-to’ guide to exploring Saskatchewan ghost towns. Get out a map, the website instructs, and pick a direction. It does not seem to matter much which way you drive from Saskatoon – although west and south will yield the most fruitful results. Don’t ask permission, it instructs. Just take your camera and your common sense and go. As a rural landowner, I shudder at such instruction. You could be charged with trespassing, should someone choose to make an issue of your guddling around in their back forty. Yet, some towns welcome ghost town explorers. Recently, I was with a film crew from Saskatoon that visited Bents, Loverna, and Whitkow to create a mini-documentary on ghost towns for SaskTel’s MaxLocal On Demand channel. While I was leery at first about poking through the abandoned buildings, it was clear that Loverna area residents welcome, even anticipate, such visitors. Well-researched markers line the empty streets, one on each lot. The markers note all the businesses that once operated along the wind-swept almost-empty town. The popularity of ghost town hunting is increasing. 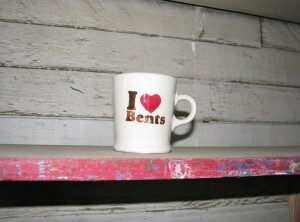 At Bents, the hall, store, and grain elevator – complete with signs and artefacts – entices so many visitors that coffee mugs have been created that celebrate its ghostly existence. “I found it! Bents, SK” and “I (Heart) Bents”. Come and see for yourself. I’ll show you the way. Or if you’re feeling adventurous, buy a map. Photo of Bents general store, January 10 2012. Photo by author. Photo of Bents cup, January 10 2012. Photo by author. Merle Massie is a writer and historian, and a postdoctoral fellow in the School of Environment and Sustainability at the University of Saskatchewan. She and her husband farm in the RM of Marriott in west-central Saskatchewan. Find her blog at: http://merlemassie.wordpress.com/. A lovely article. Ghost towning in SK was a great experience for us; we filmed a scene from our new film in an abandoned school outside of Saskatoon last summer too. Although… I must protest that our website doesn’t say “don’t ask for permission.” It suggests that if there is anyone around to ask, ask them. It is exceedingly difficult to find the owners to abandoned structures though. Just clarifying. Thanks for mentioning us. Actually, the government hasn’t been about supporting ‘efficient’ farms – whatever that means – but about depopulating the rural west, and maximizing the wealth that can be extracted from it – for the benefit not of consumers or farmers, or western Canadians, but for the railway owners, grain company owners, and chemical company owners who live elsewhere. Two quarter farms used to be the norm and the people who lived on them could support families of 15 on them. Then section farms became the norm. Then the Crow Rate was killed and multi-section farms came to be the norm. Now there are farms that are entire townships in size. And with the wheatpools and wheatboard gone, farms that size will become the norm. Thank the feds – Liberal, Progressive Conservative, and Conservative – and their policies for turning out the rural lights. Economics, mechanics, and machinery, not so much. Thank you for sharing your article. We travelled thru Saskatchewan in 2009 and stayed one night in Bents. I did capture some images from that trip that are on my web page. 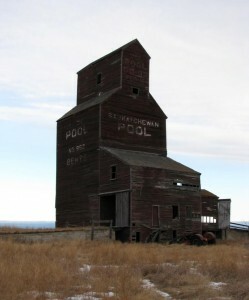 One thing that I did find from our travels in Saskatchewan and Alberta is that most of these old elevators are disappearing very fast from the landscape. Places like this should be protected for future generations. I read your article about Loverna with interest. I think you have mistaken why the markers were erected. You say “that Loverna area residents welcome, even anticipate, such visitors”. in fact, the markers were erected for a homecoming celebration held in the summer of 2000 when many people with connections to the community came back for a celebration. It is nice that other tourists enjoy them as well. I grew up in Marriott. Moved away in 1989 after I had finished school. Had a blast growing up in the area. I know the towns of Valley Centre and Bents very well. The reason there’s redo many a banded towns has to do with better roads and not relying on railroads to deliver everything to small towns. The towns were about8 miles apart in the early days. No need for that in this age.